(From Hamamatsu): Shin Hamamatsu (not to be confused with Hamamatsu Station)-Dai Ichi Doori-Enshu Biyoin-Hachiman-Sukenobu-Hikuma-Kamijima-Jidosya Gakko Mae-Saginomiya-Sekishi-Enshu Nishigasaki-Enshu Komatsu-Hamakita-Misono Chuo Koen-Enshu Kobayashi-Enshu Shibamoto-Enshu Gansuiji-Nishi Kajima. Shin-Hamamatsu Station (新浜松駅 Shin-Hamamatsu-eki) is a terminal train station on the Enshū Railway Line in Naka-ku, Hamamatsu, Shizuoka Prefecture, Japan. Hamamatsu Station servicing the Tōkaidō Main Line and Tōkaidō Shinkansen lines is a three-minute walk away. Shin-Hamamatsu Station was established on September 1, 1927, as Asahimachi Station (旭日町駅 Asahimachi-eki). Its reinforced concrete station building was also the headquarters of the Enshū Railway, and was regarded as one of the most modern buildings in Hamamatsu. It was destroyed during the bombing of Hamamatsu in World War II. The station was rebuilt after the war, and renamed Shin-Hamamatsu in 1953. The tracks were elevated in 1981, and a new station was constructed 100 meters to the northeast, closer to Hamamatsu Station. On the former site now stands the Hamamatsu Meitetsu Hotel. 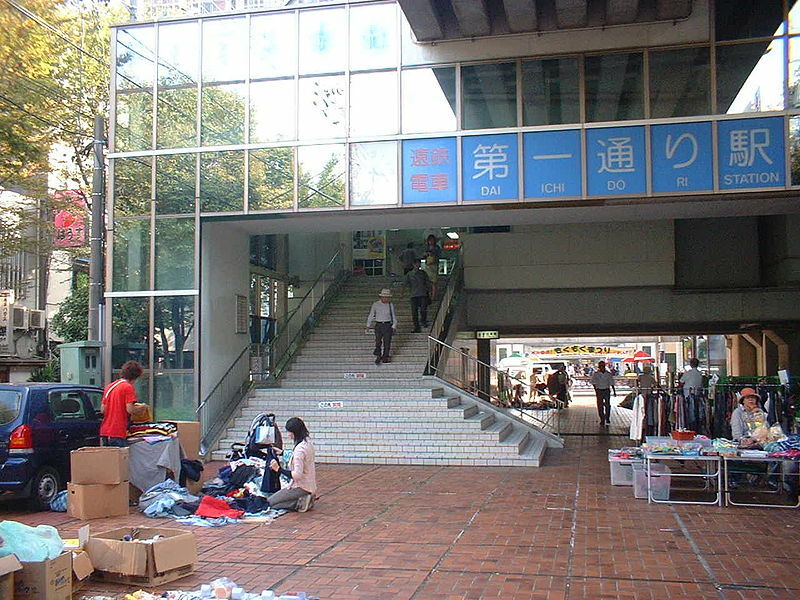 The associated Entetsu Department Store opened within the station building in 1988, and the station was modified to become barrier free in 2004. Dai-Ichi-dōri Station was established on December 1, 1985, as a commuter station in downtown Hamamatsu city. Dai-Ichi-dōri Station is viaduct station with a single elevated side platform. It is manned during daylight hours. The station building has automated ticket machines, and automated turnstiles, which accepts the NicePass smart card, as well as ET Card, a magnetic card ticketing system. Enshū-Byōin Station was established on June 1, 1958 as Entetsu Hamamatsu Station (遠鉄浜松駅 Entetsu Hamamatsu-eki), the original terminal station for the Enshū Railway Line. The current Shin-Hamamatsu Station is located on what was formerly the rail yard. 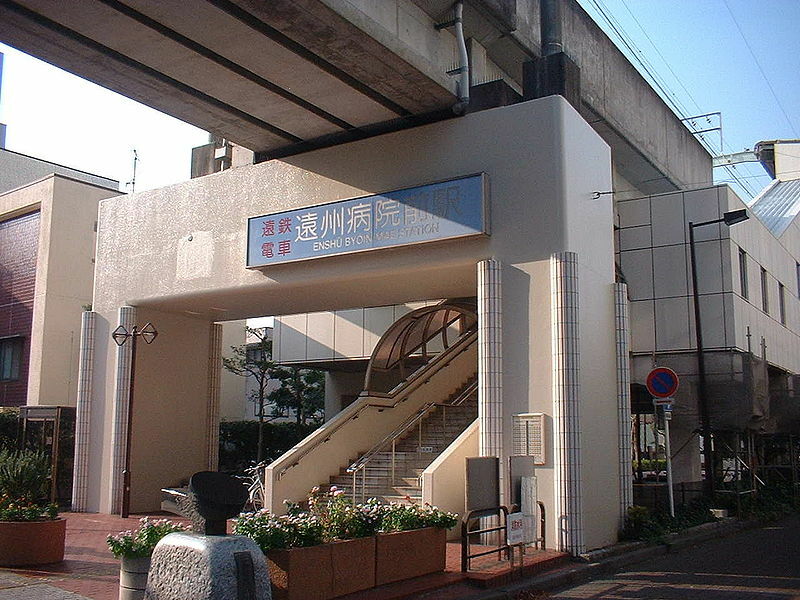 The station was renamed as Enshū-Byōin-mae Station (遠州病院前駅 Enshū-Byōin-mae-eki) in1985 and renamed to its present name in 2007. 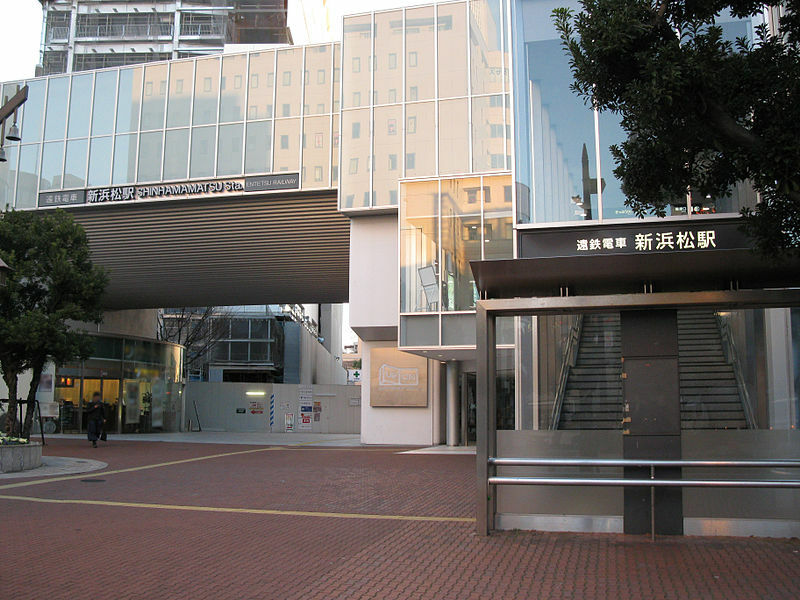 In April 2007, the Enshū Hospital, after which the station was named, was relocated, and the station name is now under reconsideration. Enshū-Byōin Station has dual opposed elevated side platforms, with the station building located underneath. It is manned during daylight hours. The station building has automated ticket machines, and automated turnstiles which accept the NicePass smart card, as well as ET Card, a magnetic card ticketing system. Hachiman Station was established on April 1, 1930 as Mayu-Ichiba-mae Station (繭市場前駅 Mayuichibamae-eki). The station was renamed to its present name in 1985. Hachiman Station is an elevated station with dual opposed side platforms. It is manned during daylight hours. The station building has automated ticket machines, and automated turnstiles which accept the NicePass smart card, as well as ET Card, a magnetic card ticketing system. Sukenobu Station was established on December 6, 1909. It was renamed as Enshū-Sukenobu Station (遠州助信駅 Enshū-Sukenobu-eki) in 1926, reverting to its original name and moved from Shinzu-cho (新津町) in 1985. The station building was rebuilt in 1953. All freight operations ceased in 1974. The tracks were elevated and a new station building was completed in 1985. This station had an island platform serving two tracks. Sukenobu Station is an elevated station with dual opposed side platforms serving two tracks. It is manned during daylight hours. The station building has automated ticket machines, and automated turnstiles which accept the NicePass smart card, as well as ET Card, a magnetic card ticketing system. 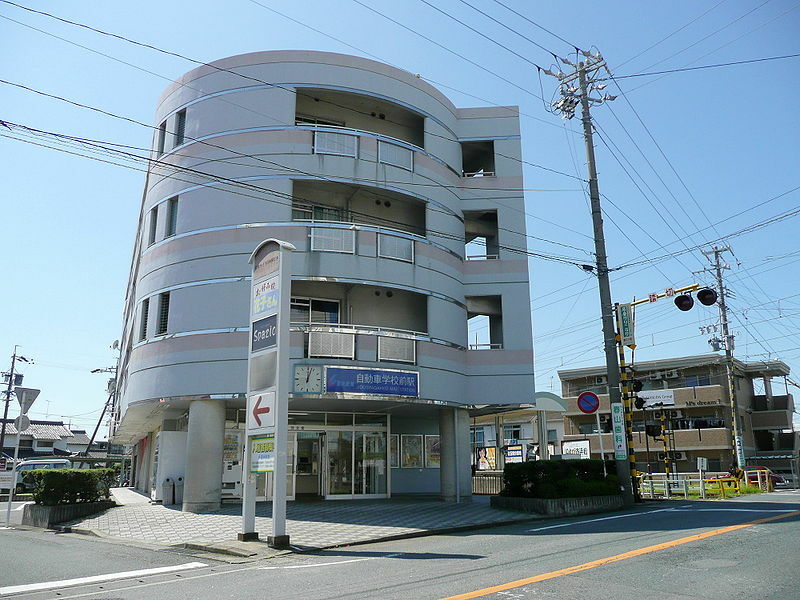 Hikuma Station was established on December 6, 1909 as Nakanogo Station (島ノ郷駅 Nakanogo-eki). It was renamed as Enshū-Nakanogo Station (遠州島ノ郷駅 Enshū-Nakanogo-eki) in 1926, renamed as Enshū-Hikuma Station (遠州曳馬駅 Enshū-Hikuma-eki) in 1951, renamed to its present name in 2012. This station was an unmanned station with a single side platform as Enshū-Hikuma Station. 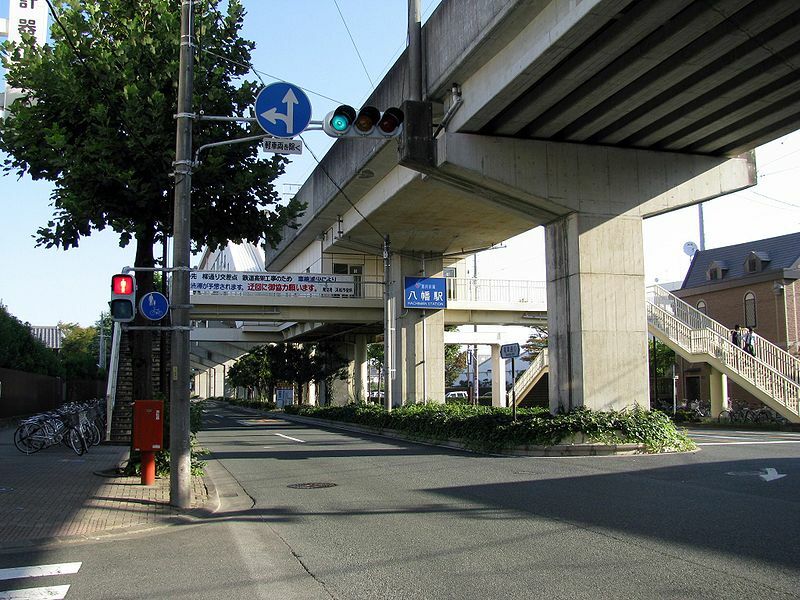 Hikuma Station is an elevated station with dual opposed side platforms serving two tracks. It is manned during daylight hours. The station building has automated ticket machines, and automated turnstiles which accept the NicePass smart card, as well as ET Card, a magnetic card ticketing system. 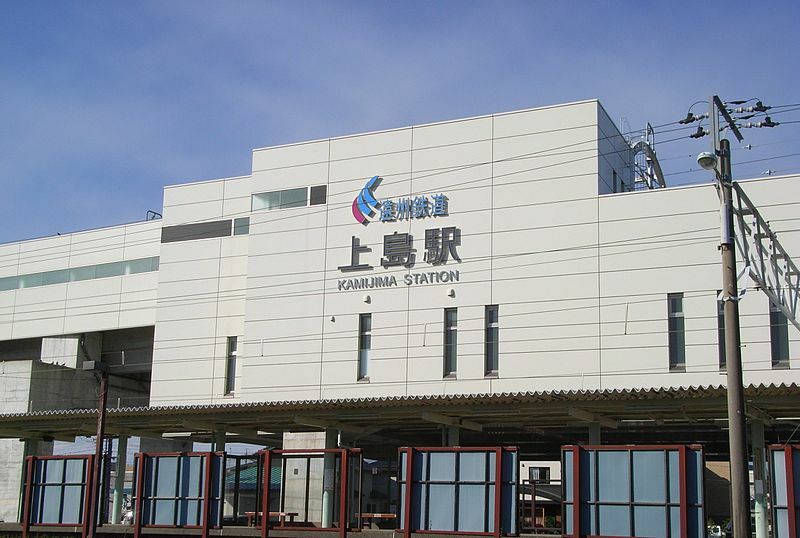 Kamijima Station was established on December 6, 1909. 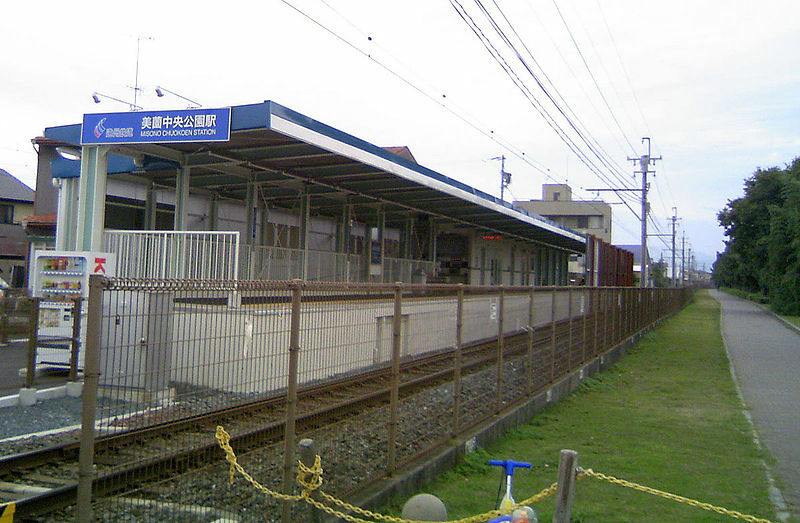 It was renamed as Enshū-Kamijima Station (遠州上島駅 Enshū-Kamijima-eki) in 1926, reverting to its original name in 2012. Freight operations began in 1956 with the completion of a large oil terminal nearby; freight operations were discontinued in 1975. This station had a single island platform as Enshū-Kamijima Station. Kamijima Station is a manned station. It is an elevated station with dual opposed side platforms serving two tracks. The station building is located on one end of the platform. The station building has automated ticket machines, and automated turnstiles which accept the NicePass smart card, as well as ET Card, a magnetic card ticketing system. Jidōsha-Gakkō-Mae Station was established on December 6, 1909 as Ichiba Station (市場駅 Ichiba-eki). It was renamed to Enshū-Ichiba Station (遠州市場駅 Enshū-Ichiba-eki) in 1926. The station gained its present name with the opening of a large driver’s training school nearby in 1966. The station has been unmanned since September 1974. 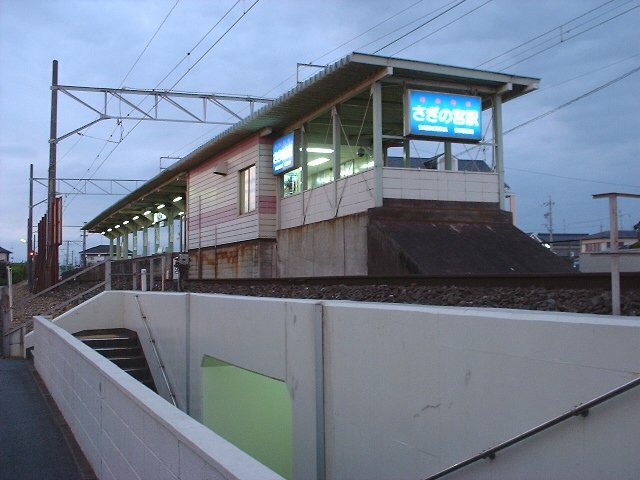 Jidōsha-Gakkō-Mae Station is an unmanned station with a single island platform. The station building is a four-story building, with the upper floors as private condominiums. The station building has automated ticket machines, and automated turnstiles which accept the NicePass smart card, as well as ET Card, a magnetic card ticketing system. Saginomiya Station was established on December 6, 1909. 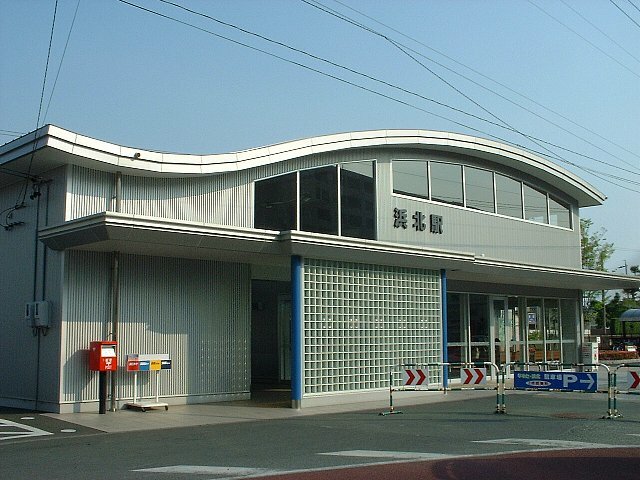 In October 1972, the station was rebuilt at a new location 100 metres north of its original location, and the next station on the line (the Enshū-Niimiura Sttation (遠州新村駅) was abolished. 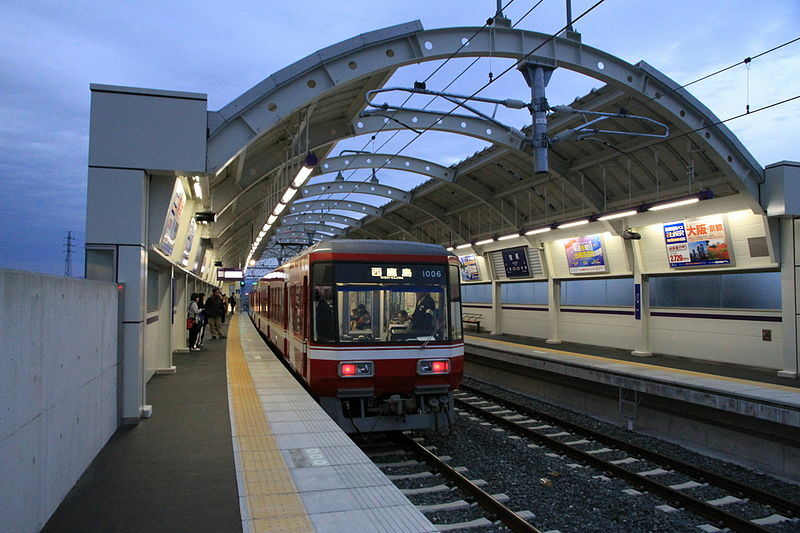 Saginomiya Station is a manned station with a single side platform. The station building has automated ticket machines, and automated turnstiles which accept the NicePass smart card, as well as ET Card, a magnetic card ticketing system. 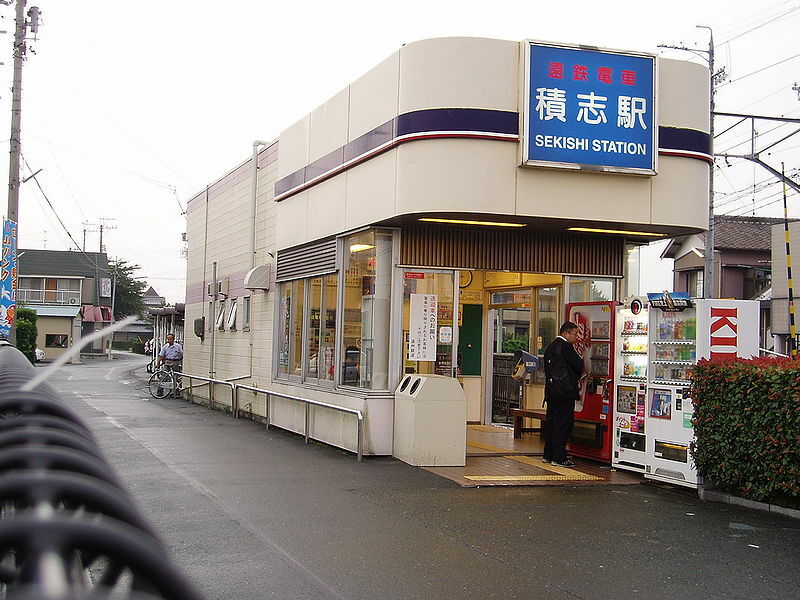 Sekishi Station was established on December 6, 1909 as Matsuki Station (松木駅 Matsuki-eki). In 1926, the station was renamed Enshū-Matsuki Station (遠州松木駅 Enshū-Matsuki-eki). It gained its present name in June 1964. The station has been unmanned since 1974. Sekishi Station is a manned station with a single island platform. The station building has automated ticket machines, and automated turnstiles which accept the NicePass smart card, as well as ET Card, a magnetic card ticketing system. Enshū-Nishigasaki Station was established on December 6, 1909. It was renamed Enshū-Nishigasaki Station (遠州西ヶ崎駅 Enshū-Nishigasaki-eki) in April 1923, Freight services were discontinued from 1973. 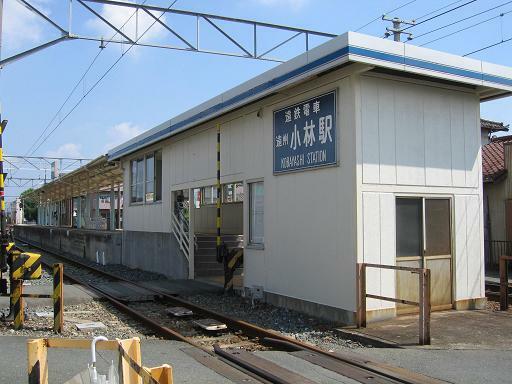 Enshū-Nishigasaki Station is a manned station with a single island platform. The station building has automated ticket machines, and automated turnstiles which accept the NicePass smart card, as well as ET Card, a magnetic card ticketing system. Enshū-Komatsu Station was established on December 6, 1909. It was renamed Enshū-Komatsu Station (遠州小松駅 Enshū-Komtasu-eki) in April 1923, Freight services were discontinued from 1973. 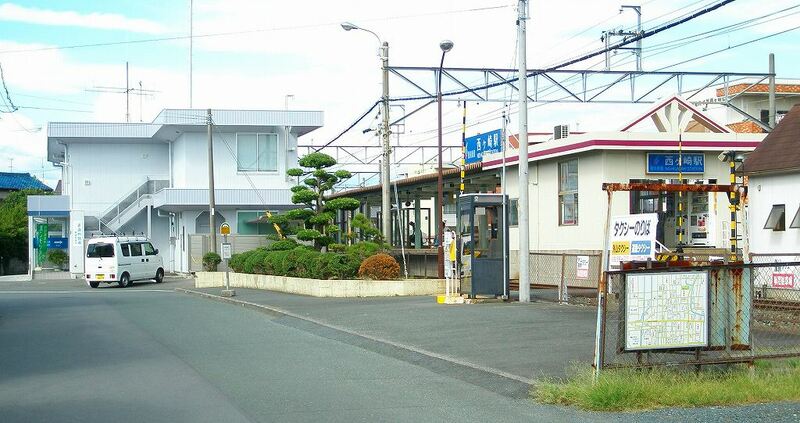 The head offices of the Enshu Railway were temporarily relocated to this station during World War II. All freight operations were discontinued in 1973. The station building was reconstructed in 1979. 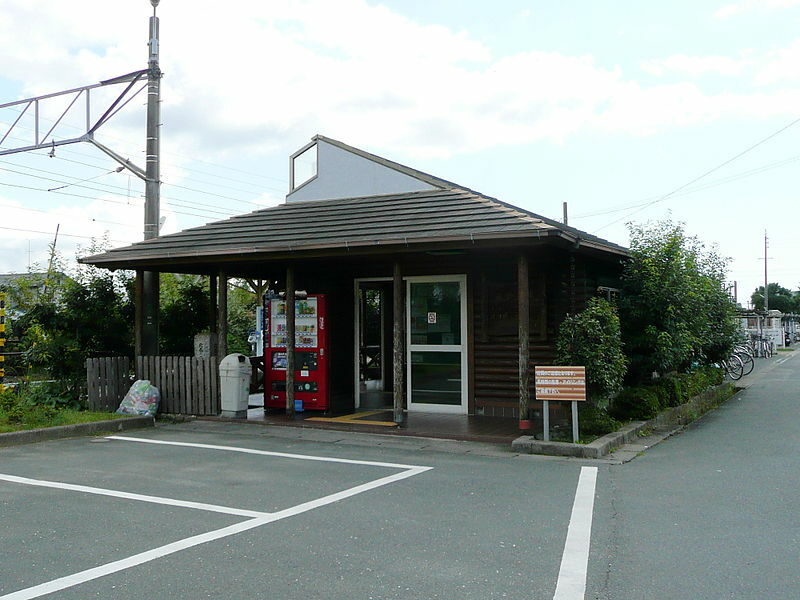 Enshū-Komatsu Station is a manned station with a single island platform, connected to a two-story wooden station building. The station building has automated ticket machines, and automated turnstiles which accept the NicePass smart card, as well as ET Card, a magnetic card ticketing system. Hamakita Station was established on December 6, 1909 as Kibune Station (貴布禰駅 Kibune-eki). It was renamed Enshu-Kibune Station (遠州貴布禰駅 Enshu-Kibune-eki) in April 1923. All freight operations were discontinued in 1973. 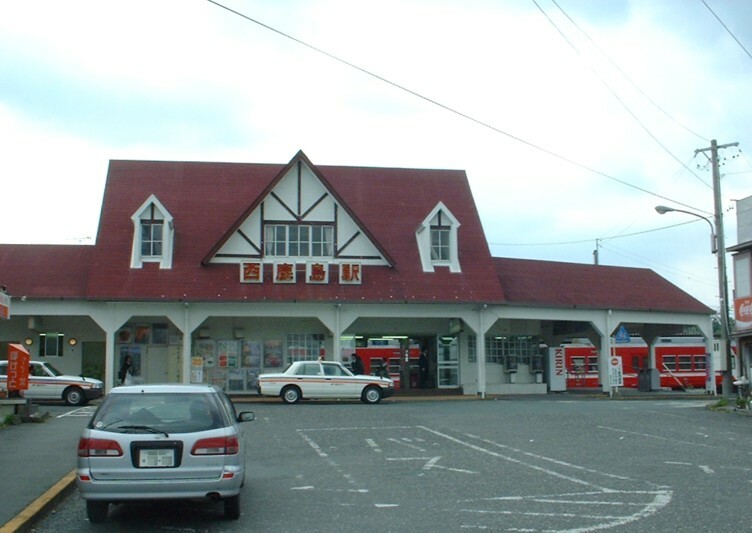 The station was given its current name in 1977, when the station building was reconstructed into a two-story structure housing a small shopping center. This shopping center closed in 2003. Hamkita Station is a manned station with a single island platform, connected to a two-story station building. The station building has automated ticket machines, and automated turnstiles which accept the NicePass smart card, as well as ET Card, a magnetic card ticketing system. Misono-Chūō-kōen Station was established on April 1, 1951 as the original “Hamakita Station”. 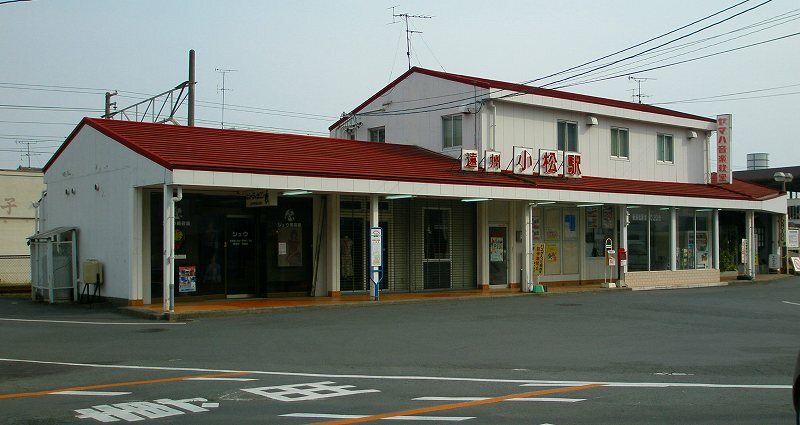 It was renamed Kitahama Chugakkō Station (北浜中学校前駅 Kitahama Chugakkōmae-eki) in August 1977, and given its present name in August 2007. Misono-Chūō-kōen Station is an unmanned station with a single island platform. The station building has automated ticket machines, and automated turnstiles which accept the NicePass smart card, as well as ET Card, a magnetic card ticketing system. Enshū-Kobayashi Station was established on December 6, 1909 as Shinbara Station (新原駅 Shinbara-eki). It was given its present name in April 1923. The station has been unmanned since 1974. The station building was rebuilt in 1982. Enshū-Kobayashi Station is an unmanned station with a single island platform, with the station building built onto one end of the platform. The station building has automated ticket machines, and automated turnstiles which accept the NicePass smart card, as well as ET Card, a magnetic card ticketing system. Enshū-Shibamoto Station was established on December 6, 1909 as Shibamoto Station (芝本駅 Shibamoto-eki). It was given its present name in April 1923. The station was rebuilt in 1990 approximately 110 meters south of its former location. Enshū-Shibamoto Station is an unmanned station with a single island platform, with the station building built onto one end of the platform. The station building has automated ticket machines, and automated turnstiles which accept the NicePass smart card, as well as ET Card, a magnetic card ticketing system. Enshū-Gansuiji Station was established on December 6, 1909 as Gansuiji Station (岩水寺駅 Gansuiji-eki). It was given its present name in April 1923. The station has been unmanned since 1974. 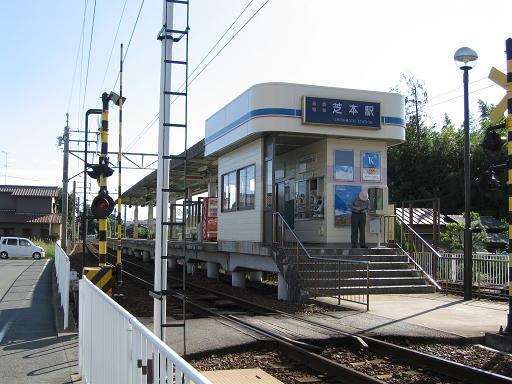 Enshū-Gansuiji Station is an unmanned station with a single island platform, connected to a small, rustic wooden station building. The station building has automated ticket machines, and automated turnstiles which accept the NicePass smart card, as well as ET Card, a magnetic card ticketing system. Nishi-Kajima Station is served by the following two lines. 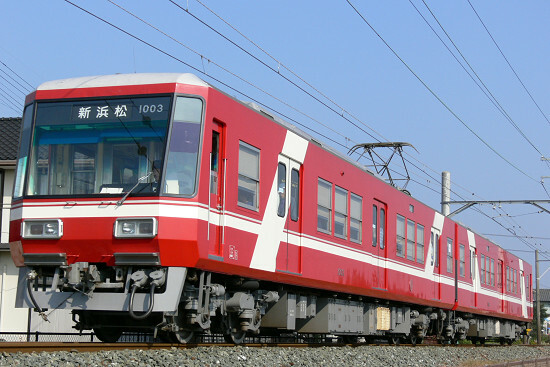 It is located 28.5 rail kilometers from the terminus of the Tenryū Hamanako Line at Kakegawa Station and 17.8 rail kilometers from the terminus of the Enshū Railway Line at Shin-Hamamatsu Station. 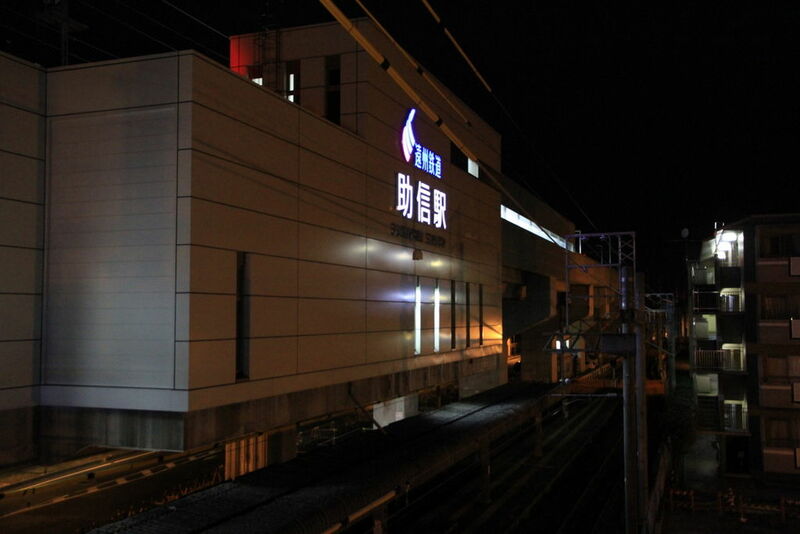 Nishi-Kashima Station opened on December 6, 1909 as the Kashima Station (鹿島駅) on the Nippon-kido (大日本軌道) Kashima Line. In 1943, as part of the wartime nationalization and consolidation of private railways, this line became part of the Enshū Railway Line. On April 1, 1923, the station was renamed Enshū-Futamata Station (遠州二俣駅), and (after coming under control of the Japanese National Railways (JNR) organization on March 1, 1938, was moved approximately 400 meters to the south, and given its present name. On June 1, 1940, JNR’s Futamata Line was extended from Enshū-Mori Station to Kanasashi Station, with an intermediate stop at Nishi-Kashima Station. Scheduled freight services were discontinued from June 1970.